A shoulder replacement is a relatively common and successful procedure that is used to treat pain and stiffness caused by arthritis and degenerative joint disease (osteoarthritis). At Orthopaedic Associates of St. Augustine’s Joint Center, our primary objective with shoulder replacement surgery, also known as shoulder arthroplasty, is to provide pain relief while restoring range of motion, strength and function of the shoulder joint. The shoulder is made up of three bones: the humerus (upper arm), scapula (shoulder blade), and clavicle (collarbone). It is a ball and socket joint where the ends of the bones are covered with cartilage. The cartilage acts as protection and also enables the bones to move as a unit more easily. Muscles and tendons surround the shoulder joint to provide stability and support. Overtime these components wear down and cause pain and stiffness. When pain and range of motion cannot be improved with non-operative treatment such as pain medication and physical therapy, shoulder replacement surgery may be necessary. Our shoulder specialists Albert Volk, MD and Sina Kasraeian, MD carefully administer a series of tests to evaluate the motion, strength and stability of the shoulder upon your visit. X-rays are then taken to further analyze the condition of the shoulder joint. 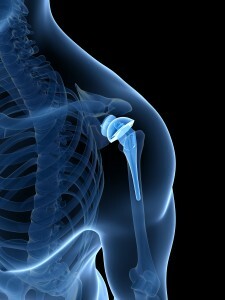 Only after a thorough examination will we determine if shoulder replacement surgery is necessary. Non-operative treatment is always considered prior to surgery. However if non-surgical treatments are unsuccessful, surgery is often recommended. Shoulder replacement surgery requires replacing the head of the humerus (“ball”) with a metal ball and inserting a smooth plastic surface on the glenoid (socket). In some cases only the head of the humerus is replaced (hemi-replacement). You may be a candidate for a reverse shoulder arthroplasty if you have extremely limited range of motion prior to the surgery secondary to a massive rotator cuff tear along with arthritis. This is where the socket or glenoid is replaced with a metal head or ball, and the humeral head or ball is replaced with a socket. This can restore limited but functional range of motion with less pain. Arthritic pain is primarily gone after surgery, but patients do feel pain from the surgery itself. As long as the shoulder implant is properly positioned and stable, physical therapy will be the first step in the recovery process. When a patient is not performing therapy exercises, the shoulder is immobilized with a removable sling. Patients can expect to return to light activity about six weeks after surgery. Active use is expected about 8 weeks after surgery. At three months after surgery, patients feel comfortable and have about half of their range of motion regained. At six months, many patients are pain-free and have about two-thirds of their strength and range of motion back. At one year, patients should be pain-free and should be capable of demonstrating full range of motion and good strength. A small ache may be associated with excessive activity. Most patients are able to return to the activities they enjoy one year after surgery – including sports like golf and tennis. If you would like to learn more about shoulder replacement surgery or need to make an appointment with one of our specialists, call 904-825-0540 and we’ll happily assist your needs.